April 22, 2016: Sports Safety Clinic with WNBA All-Star Tina Charles. 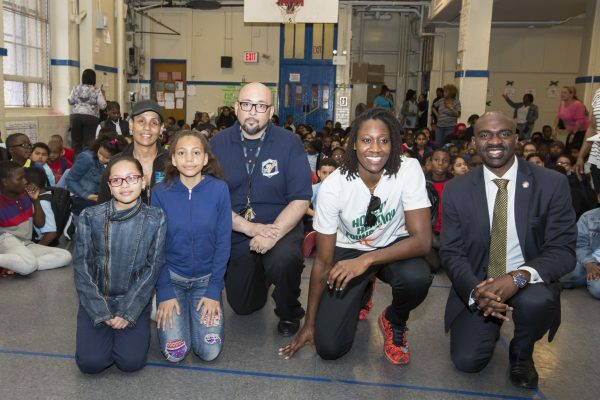 NEW YORK, NY – May 5, 2016 – WNBA All-Star and center for the New York Liberty, Tina Charles, visited New York City schools on Friday, April 22 for interactive sports safety clinics hosted by Safe Kids New York City and Hopey’s Heart Foundation. 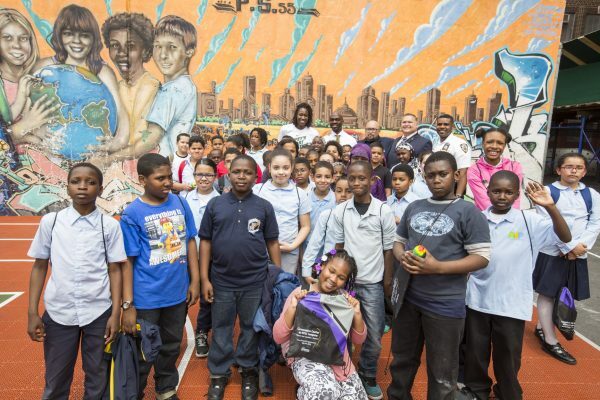 As part of the Third Annual Hopey’s Day, students at the Aerospace Science Magnet School (PS 127) in Queens and the Benjamin Franklin School (PS 55) in the Bronx had the opportunity to interact with Charles while they learned about concussions, proper hydration and how to avoid preventable sports injuries. They also learned the importance of being prepared with CPR and AEDs (Automated External Defibrillators) alongside partners HeartSmart.com and EMS Safety. 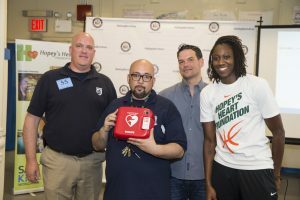 While Hopey’s Heart Foundation has been focused on preventing sudden cardiac arrest deaths across the nation and the globe, Tina Charles, the founder was born and raised in East Elmhurst, Queens just blocks from PS 127. 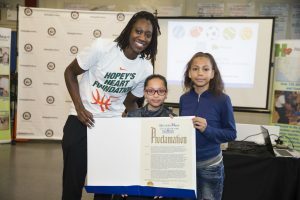 The events at PS 127 and PS 55 mark the beginning of the Hopey’s Heart Foundation Build Up NYC program, which will focus on reaching more parents, coaches and young athletes throughout New York City. The program will aim to place AEDs and CPR certify the five boroughs of New York City with a priority on low and moderate income communities that demonstrate high need such as: schools, community based organizations, parks & recreation programs and emergency response units through partners HeartSmart.com and EMS Safety. New York State Assemblyman Michael A. Blake, District 79, presented Ms. Charles with an official citation announcing April 22 as Hopey’s Day. Given the importance of the work Hopey’s Heart is doing in New York City with their Build Up NYC initiative, the Mayor of New York City Bill de Blasio issued a proclamation declaring April 22nd, 2016 as Hopey’s Day in New York City. In addition, U.S. Congressman Joseph Crowley (District 14) presented Charles with an official Congressional Record entry marking April 22nd as Hopey’s Day. The Hopey’s Heart Foundation was formed in memory of founder Tina Charles’ late aunt Maureen “Hopey” Vaz, who died of multiple organ failure on March 9, 2013. Founded in April 2013, Hopey’s Heart Foundation (“HHF”) is dedicated to raising awareness to Sudden Cardiac Arrest from claiming the lives of promising student athletes around the world. It is committed to placement of automated external defibrillators both nationally and internationally with its Automated External Defibrillators (“AED”) Grant Program. The AED Grant program welcomes all non-profit organizations, including schools, parks & recreations and emergency response departments. To date, HHF has 205 recipients, 18 international and 187 domestic. Based on the success of the HHF AED program, Hopey’s Heart Foundation is launching the “Build-Up NYC” program to support the large demand in NYC with AED placement and CPR Training, as well as expand the Beating Hearts Initiative led by Council-member Steven Matteo. The purpose is to place AEDs across the five (5) boroughs of New York City with a priority on low and moderate income communities and demonstrated high need. With the critical support of two of our key partners [EMS and HeartSmart.com], Hopey’s Heart proposes serving youth, adults and senior citizens across New York City via schools, NYC parks & recreation, emergency response departments and major community partners. Safe Kids Worldwide is a global organization dedicated to preventing injuries in children, the number one killer of kids in the United States. Safe Kids works with an extensive network of more than 400 coalitions in the United States and partners with organizations in 25 countries around the world to reduce injuries from motor vehicle collisions, sports, drowning, falls, burns, poisonings and more. To learn more about Safe Kids Worldwide visit www.safekids.org. Michael Blake represents the 79th District in New York State, including Concourse Village, Morrisania, Melrose, Belmont, Claremont and East Tremont. His vision of “3, 2, 1” focuses on Economic Development through Minority and Women Owned Business Enterprises & Technology, Education and Equality for All, especially for Women and Veterans. Blake also serves on the My Brother’s Keeper Alliance as a national advisory board member (the only state legislator in the nation); is the 2nd Vice-Chair of the NY Black, Puerto Rican, Hispanic and Asian Legislative Caucus; and is Chair of the Mitchell-Lama subcommittee and a member of the Corrections, Housing, Banks, Veterans, Election Law and Governmental Operations committees. Blake passed three legislative bills in his first year in office, including his signature prompt pay bill which will require New York State to pay contracted companies with 200 employees or less in 15 days instead of 30 days.